French Version Available HERE !! 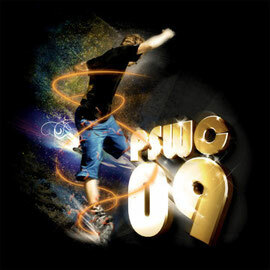 The 7th edition of the PSWC took place, like every year, on the esplanade of the Trodacero, on the last weekend of May. 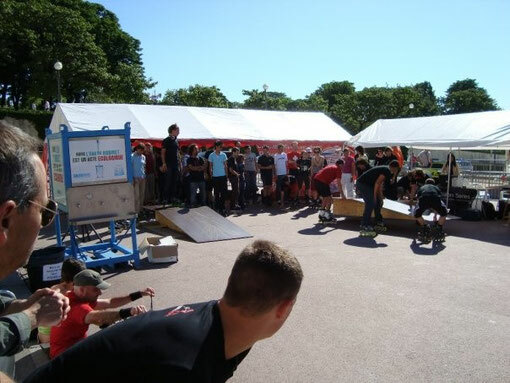 The event was organized by the association Planète Roller, Igor Cheremetieff and Sebastien Laffargue, and with the support of the CDRS (departmental committee of roller-skating – the organisor of the previous editions). This edition proposed, just as usual, Freestyle Slalom and Speed Slalom categories, but also Freestyle Classic and Slide categories – but no skateboard downhill slalom this time. 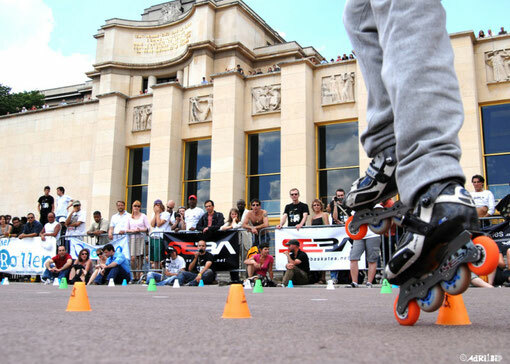 On Friday afternoon there was the Freestyle Classic category (with a general demo by night as a free gift to the Pari Roller Friday Night Skate, the break of which was on the Trocadéro. The Speed Slalom, the two first rounds of the Mens Freestyle Battle and the Slide Contest followed on from early morning ‘til late at night on Saturday. And Sunday was 100% Battle with the Womens category in the morning and the Mens in the afternoon. This year the PSWC increased in importance, the figures speak for themselves: 30.000 spectators, a big hundred of competitors who came from a big dozen of different countries… lots of people (and what people!) 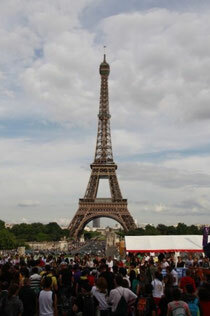 on the Trocadéro! 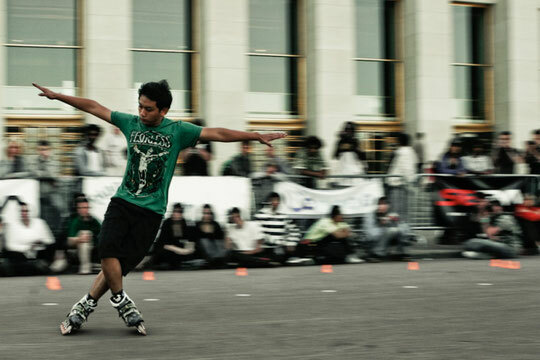 There were the Parisians for sure, Igor Cheremetieff (#2 WSSA Freestyle) and Xuan Le (#9). There were also their serious opponents from Europe like the Germans Rudy Op’t Veld (#3) and Martin Sloboda (#7), the Italian Tiziano Ferrari (#11), the Spanish Adrian Almazan (#15), the Franglish JB Milleret (#17), and the Belgian Tim Shraepen (#23). And last but not least some other opponents coming from a little further but not less threatening, like the Russian Kirill ‘ReKiL’ Ryazantsev (#24), or coming from even further like the Singaporean Terence Cheung (#19) and the world known Korean Kim Sung Jin (#5) ! As for the girls, the competition was just as tough between the Parisian Chloé Seyrès (#1), the three Russians Polina Semenova (#3), Angelika Babiy (#10) and Nadezhda Zelenova (#11)… not forgetting other significant skatergirls like the French Fanny Violeau (#4), the Germans Miriam Kwasny (#7) and Anya Ziertmann (#79 – who made a sensational entrance at Mönchengladbach (GER) last February), the Ukrainian Marina Boyko (#12), and the Italians Barbara Bossi (#46) and Chiara Lualdi (#54). Since last year, it seems that the tendency has been reversed as for the weather malediction of the PWSC, saying that it was systematically raining during the event. Thus for the second time in a row (champagne!) the event was treated to a big bright sun the whole weekend long, and though some unsexy T-shirt tans inevitably remain, let’s admit that it’s more agreeable than skating in the rain. The Trocadéro spot, world widely known for its eiffeltoweresque setting, is also unfortunately famous in the Freestyle community for its slope, the consequence of which being that it’s quite tricky to stay on the cones. The slope destabilized more than one skater… but it’s fun, and it adds a bit of spice to the challenge! It’s been a few years that the PSWC hadn’t organized a Classic Freestyle category, but this year it was the category opening the event on Friday afternoon. Ladies first, men following. This time for this category, the marking-scheme gave advantage to style, and not to technique. The Womens category was the kick-off of the PSWC. The girls were 11, the half of them were French, plus some Italians, a Russian, a German and a Ukrainian. To deplore: the non-participation of the Russians Polina Semenova (who was judging… it’s true a woman can do several things at the same time, but sometimes it’s too complicated) and Nadezhda Zelenova who lacked time to prepare a program. The performances on the whole were not extraordinary… maybe it was due to the delay of setting off? The men were 26 to participate. Kim Sung Jin (KOR) shows a ultra-stylish and fast run (normal)… his technical elements are not all mastered (abnormal) – though there are still some impressive parts (cf. his last seven on four cones set to the “1, 2, 3, 4” countdown of the music). However, it’s enough to get the first place, slightly infront of Igor Cheremetieff (FRA), more powerful in his skating but also less smooth, which probably costs him the first place. The third and fourth places go to Xuan Le (FRA) and Terence Cheug (SIN); for both skaters a deep reflection on the global visual depiction can be felt – two original styles very pleasant to watch. Follow Tiziano Ferrari (ITA), Antoine Colange (FRA) with a slower run that those of his fellow-skaters but balanced, Martin Sloboda (GER) in a total improvisation, Tim Schraepen (BEL) with the public in his pocket, JB Milleret (UK) and Alex Shulan (BRS). Beyond the first ten places we can find Dmitri ‘Man’ Milyokhin (RUS, 12th), Adrian Almazan (SPA, 14th), Denis ‘Disa’ Islamov (RUS, 16th), Boris Rozbroj (FRA, 18th) and Victor Bermudez (SPA, 19th), and at last Rudy Op’t Velt (GER, 26th) disqualified for having given up in the middle of his run. The PSWC innovates with a little originality: a launching board for the start! a double-use board: changing the handling of one’s speed taking during the run up, but also setting off the skaters at the start. The board enabled to reduce the times, judging by the average time during the competition – around 5.6 for the KO Systems. Because there were 51 men and 16 women, the time-trials took quite a long time to be completed. The skaters went one after the other following the inverse WSSA World ranking. Only the first sixteen times (for the men – a first eight for the women) qualified for the KO Systems. It was more or less intuitive according to the skaters to adapt to the launching board, judging by the quantity of strikes during those qualifications! The biggest surprise, it’s Yohan Fort (FRA, #64 at the Speed Ranking), the winner of the last two editions, who is disqualified for having touched the ground with his free foot during both of his qualification runs! Jimmy Fort (FRA, #NC), the little brother, saves face in qualifying 16th for the KO Systems. The other big surprise, it’s Martin Violeau (FRA, #227) who gets the best time of the qualifications (4.74 with free start); a surprise because it’s the tourist who’s just got out of his train, wearing surfing clothes and a beret, who ranks first – otherwise, knowing the potential of the so-called tourist, I’m not that surprised. Martin Violeau is folloed by JB Milleret (UK, #4), Romain Lebois of the Dragon Riders (FRA, #74), Savio Brivio the winner of M-Gladbach (GER) et Ancona (ITA) (#37), Tiziano Ferrari (ITA) the current #1 : this is for the top-five. Other opponents amongst the dozen of the other qualified (ReKiL (#12), Kim Sung Jin (#32), Sébastien Trocars (#33)) haven’t said their last words! All the skaters mentioned above go through… all but one! Indeed, Martin VIoleau (1st of the qualifications ranking) is knocked out by Jimmy Fort (16th and last qualified). All the eighths are won in two runs – apart for that of Sébastien Trocars who needed three runs before knocking out Jorge Teba (SPA, #NC). In quarter finals, Jimmy Fort goes on his way, knocking out ReKiL this time, and qualifying for the semi-finals. Romain Lebois and Kim Sung Jin win their respective rounds in two runs, at the expense of Sébastien Trocars and JB Milleret. The semi-finals are quickly done in two runs by Tiziano Ferrari and Romain Lebois, who eliminate beyond dispute (faster, neater) their opponents, Jimmy Fort and Kim Sung Jin. The two knocked out fight in a consolation final, won in two perfects by Kim Sung Jin. The final gathers Riziano Ferrari, the world #1 and current WSSA European Champion, and Romain Lebois, who had ended up third at the 2008 edition and who had swore to himself he’d do better next time (objective reached). The final unfolds in only two runs, but two very close runs – equivalent times, Romain Lebois with a lead of three hundredths on both runs. The victory depended on penalties: Romain Lebois knocks two cones on both runs while Tiziano only knocks one cone on the first and none on the second – advantage to Tiziano… who wins the 2009 edition of the PSWC in Speed Slalom! Amongst the sixteen who subscribed, only eight were qualified for the KO Systems. The two Italians Chiara Lualdi (#39) and Barbara Bossi (#32) are in the lead of the qualifications with times in 5.08 and 5.2. Chloé Seyrès (#1) is on their heels with 5.23; Alizée Bert (#NC) and Fanny Violeau (#3) follow in 5.46 and 5.57. The three last qualified are the Parisian Emilie Audrezet (#51), the Belgian Vicky Denissen (#11), and the German Anya Ziertmann (#NC). Three out of the four rounds are completed in two runs, by Chiara Lualdi, Chloé Seyrès and Barbara Bossi. The last one, opposing Fanny Violeau and Alizée Bert, is closer… wuite a lot of penalties, particularly for Fanny Violeau, which cost her the qualification to the semi-finals (despite the fact that she did faster runs). The semi-finals are France Vs. Italy: the two Italians, just faster, knock out the two French. the consolation final is won by Chloé Seyrès in two runs, relegating Fanny Violeau at the foot of the podium. The final is played in three runs and gathers the two Italians Barbara Bossi and Chiara Lualdi. Barbara Bossi, faster with only one penalty versus two for Chiara Lualdi, wins the first run; for the second run she is still faster but her two penalties (versus a perfect by Chiara Lualdi) make her lose the advantage: tie! Finally on the third run the two finalists do equivalent times but it’s Chiara Lualdi who wins the run with a lead of only three hundredth and less penalties (2 Vs. 3)… She wins the run… and thus the final! As I’m not specialized at all in slides, and (I confess) not really having followed carefully the unfolding of the category… I’d rather not say commonplace, useless and/or erroneous commentaries about it! The video of the whole category is just below – it will be more speaking. It’s the Russian Kiril ‘ReKiL’ Ryasantsev (GER) who wins the Slides final, in front of the current WSSA World Champion Jireh Goh (SIN), and the French Yohan Fort. Martin Violeau (FRA), the fourth finalist, ends up at the foot of the podium. Follow Igor Cheremetieff (FRA), Terence Cheug (SIN), Denis Mobio (FRA) and Boris Rozbroj (FRA).